After overthrowing the dictator Santa Anna in 1855, liberal forces established a new government in Mexico that greatly weakened the power of the Catholic clergy. Refusing to meekly accept a diminished status, the clergy persuaded several conservative generals to launch a coup d’etat in 1858, and form a conservative government, which led to The War of Reform. The civil war between liberals and conservatives ended in a liberal victory in 1860. Although Benito Juarez was elected president, both sides had run up sizable debts to foreign creditors during the war, and the new government was understandably reluctant to repay loans borrowed by a regime that had repressed them. Hoping to keep both his government and the creditors satisfied, Juarez tried to negotiate a long-term payment plan with the nations that held most of the debt: Britain, Spain and France. Seizing the excuse of debts from the civil war, Emperor Louis Napoleon III of France schemed to place Maximilian, the brother of Emperor Franz Josef of the Austro-Hungarian Empire, on the throne of Mexico, in order to create a pro-France Catholic empire next to the United States, which led to the French Intervention in Mexico (1861-1867). Although armies loyal to the republican government of President Juarez were defeated by a French army in 1864, Maximilian never gained the support of the Mexican populace, just the conservative elite, while the French were unable to control the countryside, which was dominated by Juaristas, guerrillas loyal to Juarez. The bankrupt Mexican government could not afford to pay the salaries of Mexican soldiers, so it failed to attract many native recruits. Even though the legitimate government only controlled four out of twenty-four provinces, it stubbornly refused to surrender. Despite Maximilian’s neutral stance during the American Civil War (1861-1865) and rejection of the Confederacy’s offer of recognition, the Union government would not recognize Maximilian as the ruler of Mexico. After the fall of the Confederacy, Maximilian made every effort to avoid giving the Union government any reason to intervene in Mexico. After the defeat of the Confederacy, Colonel James Langdon (Hudson) refuses to live under the Union government. Having outfitted a regiment at his own expense, he is now bankrupt, so he plans to lead the surviving members of his unit and their families through the Union occupation army into Mexico to meet representatives of Emperor Maximilian. Evading units of US cavalry sent to stop them, the little wagon train makes its way into Mexico. Tired of soldiering, Union Colonel John Henry Thomas (Wayne) resigns from the army with the surviving members of his unit in order to round up wild horses in Arizona and New Mexico, and sell them to the army. Thomas is joined by roughly 30 Indians from Oklahoma brought in by his adopted son Blue Boy, who is a Cherokee. When corrupt buyers for the army try to cheat him by paying a lower price and pocketing the difference, Thomas decides to sell his horses to Emperor Maximilian’s government, so his men drive the herd into Mexico. The two groups of Americans cross paths when Thomas’ men save Langdon’s people from Mexican bandits, although the ex-Confederates initially resent being rescued by Yankees. Instead of meeting up with Emperor Maximilian’s representatives, the Southerners are captured by the Juaristas, so the Confederates’ fate is in the hands of their former enemies, Thomas’ men. Langdon is clearly modeled on Confederate general Jo Shelby, and he even wears a hat with a big red feather, like Shelby’s black feather. 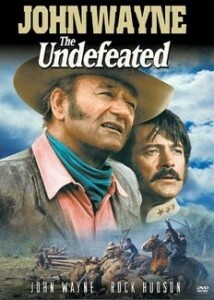 The movie’s title is a reference to Shelby’s Iron Brigade, which was called The Undefeated because they had refused to surrender and had moved into Mexico after the war. Unlike Langdon’s group, Shelby’s men went as a unit without their families because they sought employment, but Maximilian feared that hiring ex-Confederate soldiers as mercenaries would drive the American government to officially back Juarez. However, he did encourage generals and politicians from the South to settle in Mexico. 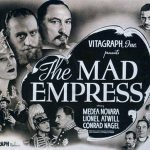 The movie refuses to take sides in the war between the French and the Juaristas, treating both sides fairly. The script is determined to present both the Union and the Confederates in a favourable light. The movie starts with a Confederate unit that was still fighting even though the men knew that General Robert E. Lee had already surrendered at Appomattox Court House. Although Lee’s surrender meant that Union victory was inevitable, a number of Confederate units did fight for months after the war. Confederate veterans are shown as defeated but still defiant. Even though the screen Maximilian had invited the Confederates to Mexico because he can no longer rely on Napoleon’s army to keep him on the Mexican throne, Langdon protests that his people are not the Juaristas’ enemy, which is a very silly thing to say. The Jauristas were trying to evict Maximilian and the French from Mexico, so anyone who supported Maximilian was definitely their enemy. The war between the French army and the Juarista guerrillas was harsh, but the script has the Juaristas act out of character. The Juaristas were tough and happily killed Frenchmen but they did not massacre women and children. Most important, the complicated deception needed to capture the Confederates was unnecessary, since the large Juarista force could have simply taken the horses from the Yankees. Moreover, it is doubtful that the French would have attacked the Americans since Napoleon had ordered his army to make every effort to avoid a war with the United States, especially after General Ulysses S. Grant had sent General Phil Sheridan with 42,000 men to patrol along the American side of the Rio Grande to intimidate the French. This was not an empty threat, since both Grant and Sheridan were strong advocates of supporting Juarez against the French. The movie is about the reconciliation between the North and the South, as well as a warning against involvement in other people’s wars. In fact, the script highlights the similarities between Langdon and Thomas. Both men are going into Mexico to escape the United States government. Both men were colonels and they quickly realize that they are equals. Both men fought honourably for their respective sides, and both men rough up the corrupt representatives of the government who try to cheat them. While the movie’s desire to promote reconciliation is laudable, the screenwriter seems to have forgotten the Indians or simply did not care. Despite Thomas’ constant defence of Blue Boy as his adopted son, none of the other Indians are invited to social events. Thomas consults with the ex-Union soldiers on vital issues but neglects to ask the Indians for their opinion, even though they make up the majority of Thomas’ group. Furthermore, the reconciliation is between white Americans, not white Southerners and their former slaves. Blacks are shown as either uppity or docile. When an obnoxious carpetbagger with a black partner shows up to buy Langdon’s plantation for a pittance, the black partner is there to ensure that no ex-slaves will work unless he says so. As the Confederates prepare to leave the plantation, all of ex-slaves are gathered, as if they do not know what to do next. Langdon gives his father’s watch to the oldest slave, saying that it is what his father would have wanted, which is a truly bizarre scene. The script does deserve credit for showing a romance between a white woman and a Native American man, even though Roman Gabriel is actually half-Filipino and half-Irish, not Native American. Director Andrew MacLaglen was essentially an in-house director for Batjac, Wayne’s production company, because he let Wayne call the shots. An unimaginative director, he basically put the camera in front of the actors while they did their scenes. 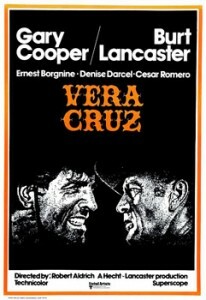 John Ford did the same except he chose better angles and made the actors act, not just recite their lines. Aside from the scene where the horses are driven into Mexico, the action sequences are lacklustre. During the bandits’ attack on the wagon train, the bandits obligingly ride up and stay in front of the wagons to be shot at. Although all of the actors are capable, Merle Olsen stands out, especially since it was his first screen role. The huge defensive tackle for the Los Angeles Rams plays happily with kids until he is summoned to fight for the unit but would rather be with the kids. Hudson radiates affable charm. One member of Langdon’s group is despised by both the Confederates and the Yankees because he had refused to fight for the South out of fear of being shot, not due to any principle. This is funny since Wayne was one of a small minority of Hollywood stars who had refused to serve his country during WWII. 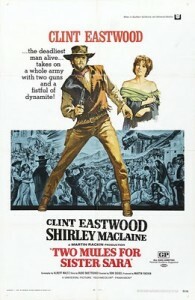 Bonnie and Clyde started the era of New Hollywood in 1967 but Old Hollywood did not disappear overnight. There is probably no better way to understand the difference between Old and New Hollywood than to watch a double-bill of The Undefeated and Two Mules for Sister Sara. The two movies were filmed in the same year and both dealt with the French Intervention in Mexico but there is a huge generational gap between them.